What is the Ab Lounger? 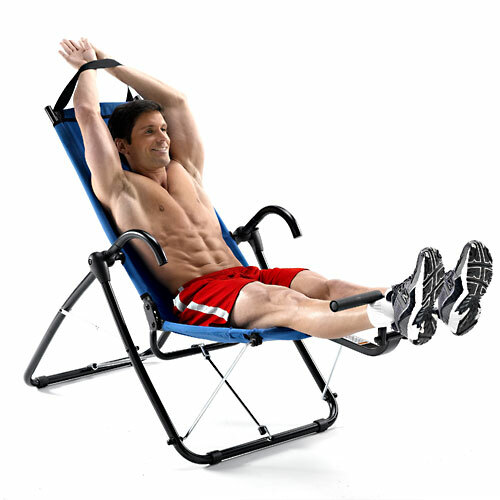 The Ab Lounger is an abdominal exercise machine which trains your upper and lower abs. Ripped Abs with the Ab Lounger? The ab lounger is a abdominal workout machine used to train your abdominal muscles while lying or 'lounging' around in a comfy chair. The premise of this machine is to work your entire abdominals (upper and lower) while having your feet underneath a bar for resistance. This review of the ab lounger will discuss the benefits, cons, price conclusions and alternatives to the ab lounger. What are the benefits of the Ab Lounger? Think about the machine itself, it resembles many other abdominal exercises that you can perform during a regular weight training workout. It can improve overall abdominal muscular strength and ab hypertrophy (increasing the muscle size in the abdominals). What are the cons of the Ab Lounger? While the advertising and benefits are that the ab lounger can give you abs, it will only do so if you have a very low body fat percentage. The advertising will have you think that if you just lie down on the ab lounger for a little while you'll get abs in no time. This is not the case. To get ripped abs you need to follow a strict nutrition plan, increase your weight training workout time in the gym and focus on HIIT: high intensity inverval training to decrease overall bodyfat. Standard knee crunches are completely effective and their is no basis for this claim. Both exercises actively work the abdominals in different ways. One is no better than the other. 1. Ab Ball Crunches: Forces your stablizer muscles to keep your body stable while your abdominals are doing the effort. 2. Ab Cable Crunches: Cable crunches put weight on your abdominals to create resistance. One of the biggest mistakes about people working their abdominals is a lack of resistance and a lack of rest inbetween workouts. You should train your abdominals just like any other muscle group in your body. 3. Leg Raises: Leg raises are a great way to increase the overall strength of your hip flexors and lower abdominals. You can also try a 'leg throwdown' technique to increase resistance. The ab lounger is a good machine but you can do many other types of abdominal exercises to give you ripped abs quickly. Remember that most people forget that you can't get abs unless you can see definition in other muscles. This is because of a layer of fat above your ripped muscles.